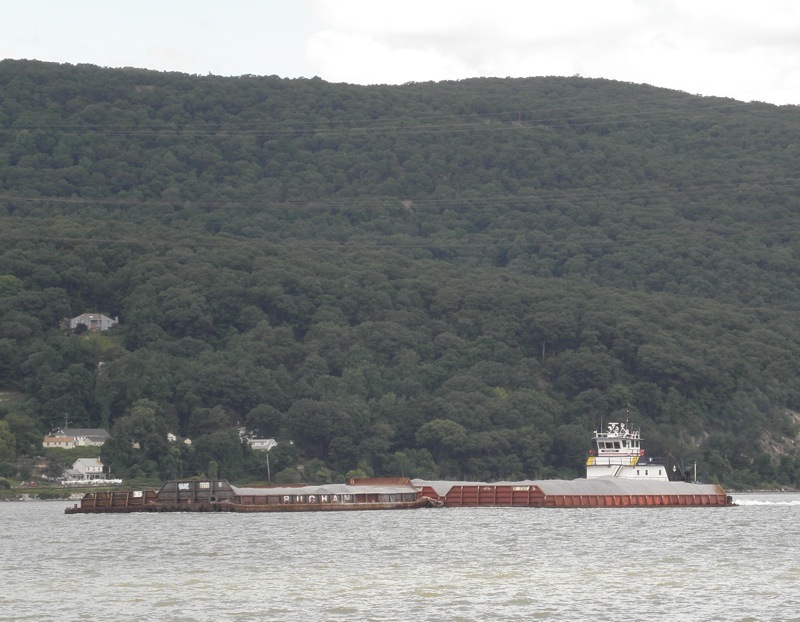 In Random Tugs 60 I mentioned a wish to locate fotos of the ghost fleet that once occupied the freight train shore of the curve in the Hudson between Stony Point and Jones Point. And now, they exist only in memory. Here’s the link Harold sent along to what is also called the “mothball fleet,” once rafted up where Buchanan 12 now pushes stone. Joe Herbert and Harold Tartell . . . many thanks. 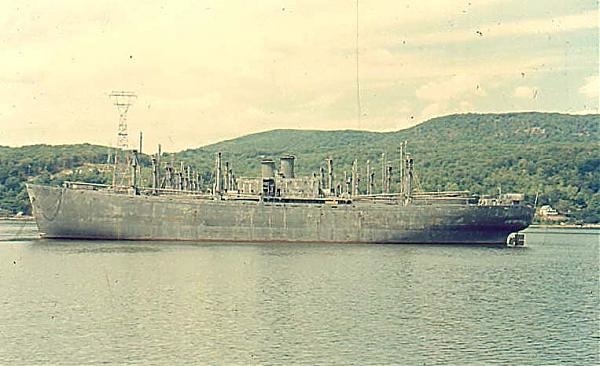 Dave Williams suggested I look up info on how ghost vessel APA-97 went from being USS Dauphin to SS Exochorda to SS Stevens, as in Stevens Institute of Technology, which I now share with you. This also leads me to CVE-1 Long Island, another vessel that served as a dormitory. I’d love to hear from someone who lived in either SS Stevens or Long Island . . . or otherwise have knowledge of life aboard. Thank you. I’ve been riveted to my computer. I went to Nyack High School in the late 50’s. The school was located on a hill overlooking the river. I often saw ships from the Reserve Fleet being towed down the river to to be sent to the breakers, It’s a wonder anyone in those east side of the school classrooms ever passed any classes! An interesting aside: my father served on those kind of ships as a USN Armed Guard gunnery officer. I’m too young to remember this, but my father and older siblings remember it well. Hi Bob Housekeeper my parents , Helen and Ralph Bianco owned the site of the present Peekskill Inn overlooking the Hudson, the Bel-aire Hotel. 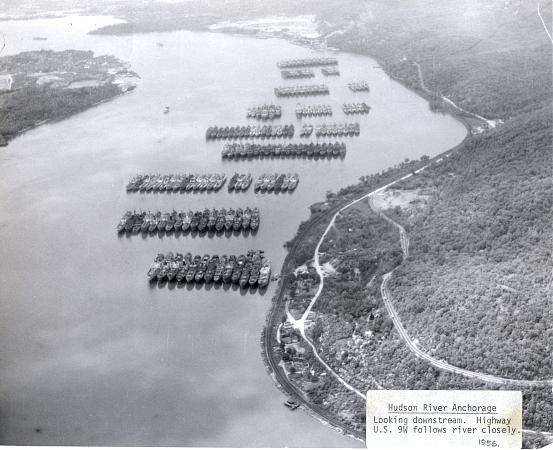 We had a wonderful view of the Fleet from 1947 to 1955 when they sold the property to Farber-Whitman who built the motel, I’m going to look through photos to see if we have any from our vantage point. It’s so very nice seeing these old photos of the mothball fleet. I always wanted some vision of where Exochorda had resided before becoming SS Stevens. I had lived on SS Stevens for 3 years while I was at the school there, in Hoboken. It was such a unique place to live, and I have many fond memories of the experience. My cabin was one of the nicer ones that I luckily had gotten after being tipped off about it becoming available. When Stevens was sailing from New York to the Mediterranean as a cruise ship, this was one of the best cabins for passengers. It was on A-deck, on the side facing Manhattan, with two portholes that opened, two berths and full bath. By then, the style was quite dated, and everything was showing its age, but for college kids, it was great. They also had rooms available on B-desk, but many of these rooms were very small, with one porthole, which had been used previously only by Exochorda’s crew members. Many of the students down there seemed to like the isolation, and I thought they were a little bit weirder than the rest of us. One of the first things I did was to rig up a small TV antenna that I attached on the outside hull using one of the bolts that secured a porthole in my cabin. I removed one other bolt and used the empty bolt-hole to route the antenna wire into the room. Being right on the Hudson all the time like that, I felt very connected with the river and saw lots of ships of all types coming and going. It was a really great place to invite friends over for ping-pong, or just hang out and watch the river and Manhattan from up on deck. You could wander around the decks and always find something to see and talk about. Sunrises over Manhattan was often spectacular. But bad weather always seemed more intense on the river. Many times in winter, I saw lots of big chunks of floating ice. During storms, I could feel Stevens rocking and rolling. One memory that wasn’t the best memory had to do with the Maxwell House coffee plant that was located just north of the ship (I think there are new condos going up in that area now). You might think that the smell of coffee early in the morning would be a good thing, but it was intense and it was awful. It wasn’t the real coffee smell that you’re familiar with. It was some kind of factory-processing smell, the kind of smell you get when all the water boils out and the coffee starts burning on the bottom with the flame on high. It had me thinking that I would never ever become a coffee drinker after that (I’ve gotten over it since then). The Wikipedia article came about out of my desire to preserve Stevens’ memory. Not too long ago, my son (also a student at Stevens) asked me if there ever really was a ship there, or was it just some made up story to tell to gullible freshman. I said that it was most certainly true, and we probably could just look it up on google, because after all, everything in the world is on google, right? But the search was completely empty. Not one thing about SS Stevens. That’s when I remembered my old photos buried in the attic, and thought about writing the Wiki article. One interesting side discovery for me was learning about USTS Texas Clipper, a maritime training ship, which was formerly one of the 4 ships (Excambion) in the 4 aces quartet of cruise ships. There are some videos showing Texas Clipper being prepared for sinking as an artificial reef off Texas, and the recovery of a mural created by the famous illustrator, Saul Steinberg. Texas Clipper was an identical sister ship to Stevens, so seeing the videos was like seeing Stevens all over again. Stevens also had Steinberg murals, but I guess they were just tossed when she was scrapped. I also had shared some memories via email with Dr. Stephen Curley who was a professor on the Clipper. In my mind, I can still see it all, and can still hear the sounds of walking up the main gangplank. That coffee smell? I try not to think about it. Stevens had such an interesting history, and I was glad to have had the opportunity to live aboard her for those years. My Grandfather served on the Stevens when it was the U.S.S. Dauphin he loved that ship. Is there any way to get copies of these photos? My father grew up in Ossining, and raised his family in Cortlandt Manor. As kids, he used to take us in his boat up close to the fleet–certainly closer than was legal to do so! Two years ago my father’s house was burned to the ground, and all of his photos of the fleet were lost. I’d be happy to pay the expenses of getting replacement photos. Thank you. joanna– i’m traveling. can you remind me again in a week and a half? 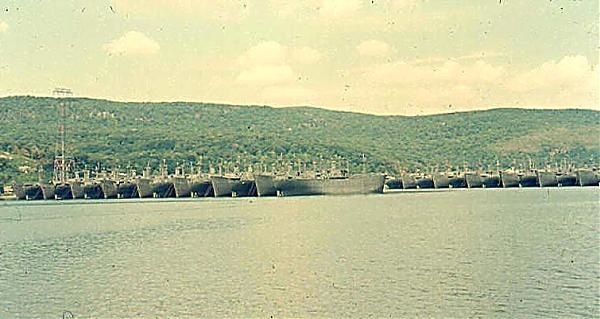 My dad worked on the Hudson River Reserve Fleet (mothball fleet) for over 35 years. The ships were sold in the 70’s to various countries for scrap. My dad got to meet people from all over the world. He was a tug boat engineer and worked on the war ships’ engines. He loved his job and being on the river. barbara– thanks for reading, and writing. 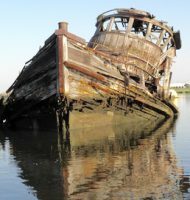 if you have any fotos of the ghost fleet, i’d love to see them and even use them on tugster. My Dad worked there too. The main office was “The Mother Ship”..the ship to shore radios were there etc. We used to go to work with Dad and do the rounds on the tugboats. In the winter, they broke ice with the tugs and kept the ship moorings open. I used to board the ships with Dad and he would punch a time clock..security detail. Did you know Doug W aka: Tubby? I don’t remember the name Tubby. My Dad passed in 1995. I do remember Novak, Ducady, Marcinac (? ), Ginroz (?) and Tribert. I might have some pictures from the 70’s. I’m sure our Dads knew each other. I don’t think it was that large of a group. I do know that it was a hard work but Dad loved it. In fact, he also spoke well of the people with whom he worked. I think they were all friends. Doug Warn was one of the last civilians to work at the fleet. By then, the last remaining ships were sold and he (according to the maritime write up) was paid by the new owners, and not our gov’t. Doug was also a model RR enthusiast. Was anything at your house painted battleship gray? LOL….our cellar walls, back steps and lawn chairs! I guess he brought home leftover paint. My Dads name was “Jack”. We lived in Vails Gate (now called New Windsor? 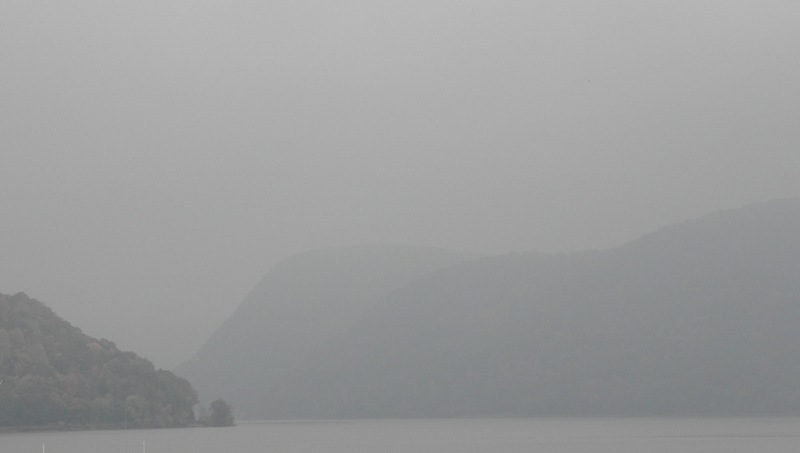 ), NY and he had to drive over Storm King Mountain to get to the fleet. My Dad loved working there. 8 to 4, 4 to midnight, midnight to 8. Moved up to New Windsor, NY in 1963. I can’t remember what year his last, maybe sometime around 67-68? Sure would be nice if there was a photo of the fleet crew. I think there was a total of 85 civilian employees. photo of a man hosing a deck and he said that was not part of his crews work detail. So they had different work details. One year on ice breaking detail he went over board. Came home so frozen he couldn’t open the door. We were home on a snow day and heard him kicking the back door. before he passed away this past October. The name Novak sounds familiar. I too remember the Moth Ball Fleet. I grew up in Yorktown and my mom’s family was from Nyack so we went from Yorktown to Nyack at least once a month. So we went over the mountain and through the woods, literally! I remember the roads being very steep and curvy. Then we went over the Bear Mountain Bridge towards the Park then south to Nyack. I can’t remember the road names as I was young then, can’t remember the road names as I’m old now. Seriously, I remember staring at the Moth Ball Fleet every time we passed it. row after row they stood like soldiers. I remember the feeling of pride I felt just looking at them. There they stood, history right before my eyes. Then one day they were gone. Boating past the Mothball fleet was a highlight of my days on the Hudson River… My family had a motorboat docked in Grassy Point – every weekend and some evenings during the week, we would take excursions on the river. It was a breath taking site to come upon these beautiful ships lined up – row after row after row.. and it was a sad moment the first time we came upon the spot were they were no more.. I wish they were still lined up today .. It was an awesome site, both my car and by boat. I would like to find a photo from Route 9W showing the view with all the ships. I remember Sunday afternoon drives with my folks & we’d drive up to the overlook at Jones Point tofrom Nyack to see ‘The Mothball Fleet’. I recall the ‘View’ machines…put in a dime & get a close-up look at the various ships. As a young teenager I was told that as Vietnam escalated, some of these ships were recomissioned as frighters/supply ships bound for Cam Rahn Bay & others were scrapped for steel to be reused for whatever purpose. Seeing these photos is a real joy. Brings back a lot of fond memories of my family. I grew up in Verplanck NY just to the East of the fleet. My dad had a boat and we would often cruise very close to and in between the ships of the mothball fleet. I know lots of guys who made unauthorized visits to the ships by climbing up the anchor chains. Since I was only about 8 or 9 years old the ships seemed huge to me. I remember sadly watching each one being towed away until there were no more left. Years later, serving in the US Navy it made me proud to think that I am serving in the same service as those ships once were, especially since I was on a WWII Aircraft Carrier. My family lived in West Point in the early 60’s. I remember driving on the mountain and looking down on all the ships. I was in kindergarten but i have always remembered how awesome they all looked. I decided to look them up today on the internet. How sad to find out they are all gone. My dad was in the Army and we saw many things but this one site has stayed with me all these years. As a very young child growing up in Manhattan, Riverside Drive, I recall boats at night “honking” to each other. My father was overseas, my mother, at home with my brother, my grandmother who left Berlin after Kristalnacht, and myself, a dark time literally in every respect. I asked my mother why the boats made the noises, and she explained that they were fog horns. But fog was not the reasons. Surely they were communicating. It was very dark outside and no lights were permitted indoors. Shades were pulled down. I peaked to see what was on the river and saw huge dark grey hulking ships. Thanks to this article I now know what these boats actually looked like. Today I visit the pier at Piermont and hope to complete a photo essay about what was once there and what is there now. I would like to add pictures of the ships; the will be paintings based on the photographs. I am so very grateful for the information here. Now I udnerstand where the boat were located . I knew that the pier was where embarkation and disembarkation occurred but I did not know where the fleet was located. I will go up there and photograph the area too as part of this project. Memory does not fail, especially when one is no more than three or so. But it needs the clarity of actual pictures to fill in the details.